Click here to get tickets to see Page Turner Adventures on March 24, 2019, at 2:00 pm! What do you get when you cross mixed up fairytales, a clown on stilts, and comedic quests? You get Page Turner Adventures, an educational stage show with supersized stories where you, the audience, is one of the main characters! 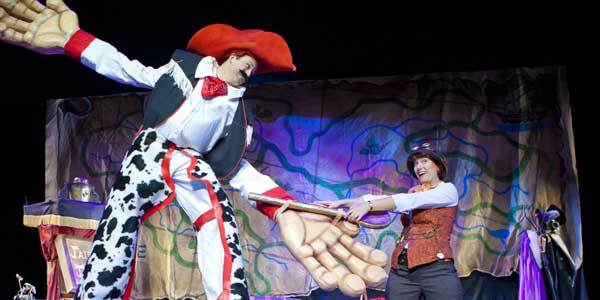 During a Page Turner Adventures show, the artists on stage interact directly with the audience, engaging them to help the characters solve problems and overcome obstacles. During a Page Turner Adventure, there’s never a dull moment, even for the littlest kids. The entire show keeps kids on their feet, moving around, and totally, completely enthralled. Professional storyteller and actress, Riley Roam, met Ringling Brothers clown Kenny Mikey, while working on children’s programming at FOX Kids. They both loved working with kids and making education entertaining, and they found themselves wondering if they could create a show that combined storytelling, the circus, and improv. It took a bit of trial and error, but finally they managed to create a show that included physical, slapstick comedy, a steampunk aesthetic, adventure – and, most of all, an engaging story – and Page Turner Adventures was born. “I”ve always loved the idea of Mary Poppins and that feel, so we always say that Page Turner is a cross between Mary Poppins and Indiana Jones and Amelia Earhart. Our goal is to turn kids into Storyologists and get them excited about books and reading and stories and literacy,” Riley told Chris Wolf. When Page Turner and her goofy sidekick come to Torrance, they will perform their all-original version of a fractured fairytale called The Mixed Up Fairytale. In the story, Page needs the audience to help her complete quests, like convincing Red Riding Hood to give up her cape, in order to break the spell that has been cast on Beauty. Even though there will be plenty of laughs to go around, there’s a message within the performance, too. “What we want kids to take away is that stories and reading and imagination are fun and that you have that within you. They become the main character, they are the storyologists, and we tell them ‘You are now all official storyologists and you need to go on adventures collecting, telling, and writing stories.’ We want them to feel empowered to read and write stories. We love to get stories from kids after our shows, and we have study guides, which are ways to help them tell their own stories and not feel intimidated by reading and writing and stories but to see them as fun and funny and part of their lives. That’s really what we want them to takeaway,” Riley said. Aside from instilling a love of storytelling to kids, Riley and Kenny had some advice for young would-be entertainers, too, for how to turn their love of art into a career. “I think it’s talking to other performers, or interning if you can, working with other people, collaborating, is really important,” Riley said. “I agree with that, but the thing is that being an artist, if you don’t know the biz, then you don’t know the biz. If you just do your art, you might feel like you have no idea how to make money doing it to make a living. Young artists might think they’re ‘selling out’, or they just want to make art and have people come to them. But it’s the show of the business or the business of the show, you have to do both aspects. If you build a community, if you collaborate with other people, if you watch to other shows, appreciate what they do, you’re going to be so much more open to different opportunities. You might find something you love even more!” Kenny added. This is an adventure you and your family won’t want to miss! When you come to a Page Turner Adventure, you become the hero of the story. The Mixed Up Fairytale is a great show for kids from pre-K all the way up to 10 years old (Don’t worry, adults will love this show, too!). Get your tickets today. Get Tickets to Page Turner Adventures!